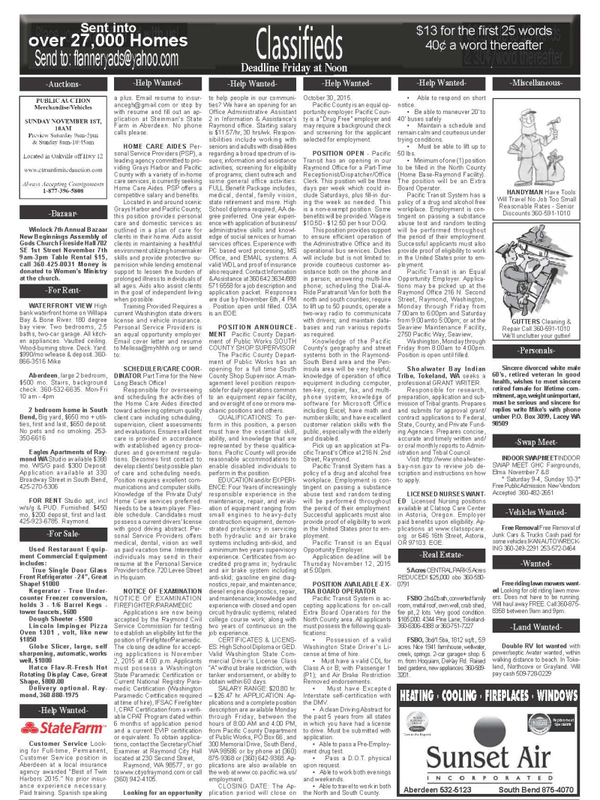 Showing 15 articles from October 27, 2015. The Hoquiam Police Department participated in an interactive training simulation for force options, through a system called the PRISim Judgment Trainer by Cubic, which involves making judgment calls under the pressure of a realistic situation. Last Thursday the county commissioners of the 19th District met to select the district's next State Senator. November 28 is Small Business Saturday, which happens the first Saturday after Black Friday. Phtoto by Pat Myers - Nominee JD Rossetti addresses the county commissioners of the 19th District during the appointment process to fill the vacated State Representative seat left by the newly appointed Senator Dean Takko. As the football season draws to a close, the Toledo Indians put another win under their belt. In the eventful game of October 23, the Indians faced the Toutle Lake Ducks. At 6 pm on October 19, the Toledo City Council Meeting was called to order. At the beginning of this meeting the council was informed of Councilman Nate Cook having called in sick. After the consent agenda, the council moved into department reports. At 6:02 pm on October 22, the Vader City Council Meeting began with full attendance. After the call to order and roll call, Councilman Mark Fenison said the prayer for the meeting and Councilman Andy Wilson led the flag salute. After the formalities, the council started the items of the agenda. Photo by Larry Bale - Pe Ell-Willapa Valley Titan Kaelin Juerk (44) picks up yardage with solid blocking against Adna Friday night at Crogstad Field in Menlo. Jurek attends Pe Ell HS. 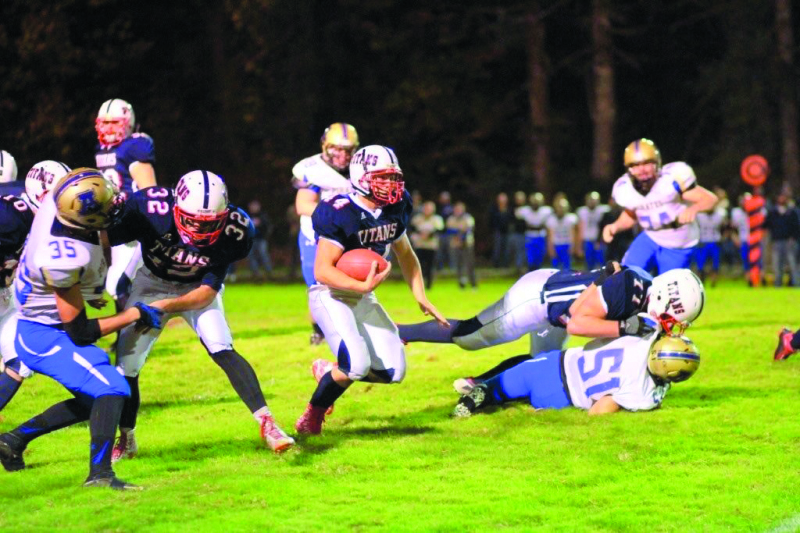 MENLO - Pe Ell-Willapa Valley notched another shutout after a 46-zero spanking of Adna at Willapa Valley's Homecoming and Senior Night Friday at Crogstad Field in Menlo. Counting the forfeit 2-0 win over Wahkiakum, it's the fifth shutout in succession for the Titans, now 8-0 on the season, and in line for an undisputed Central League championship with a win over host Morton-White Pass on Thursday. 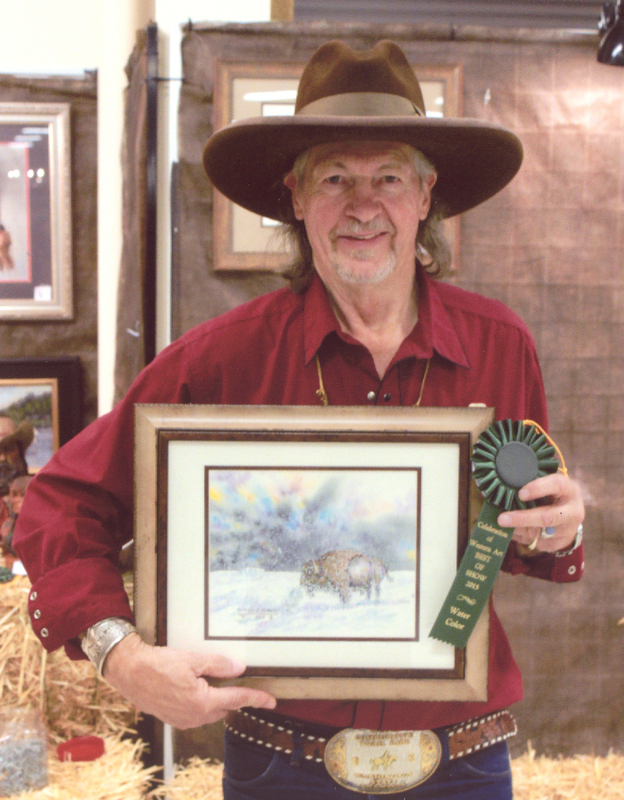 Local western and wildlife artist Kenneth J. Hurley has recently attended the Celebration of Western and Wildlife Art in Puyallup that occurred October 9 through October 11, where he won an award for Best of Show in watercolor, as well as an award in the Best Art Display. SOUTH BEND - Members of the Raymond High School Football Team, local law enforcement officers, the South Bend Fire Department, and the Pacific County Prosecutor's Office came together with Crisis Support Network to raise awareness for local issues related to domestic violence and call attention to Domestic Violence Awareness Month. The South Bend City Council met Monday night, October 26 and all members were present. The council first approved the minutes from the previous meeting and then approved the agenda for the current meeting. 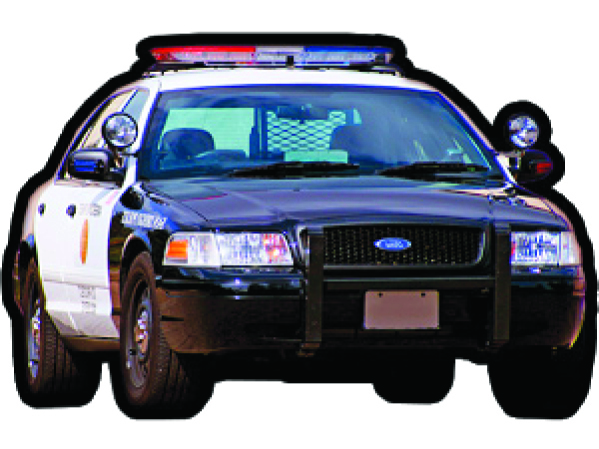 Lisa M. Ferguson, 36, of Raymond, entered a guilty plea possession of methamphetamine and second degree introducing contraband (into a correction facility) and was sentenced to four years and nine months in prison.